A new year brings new art to New York City. As we say “goodbye” to 2017, there’s much to look forward to in the art world in the coming year, including a giant portrait of Russian President Vladimir Putin made out of 5,000 bullet shells. 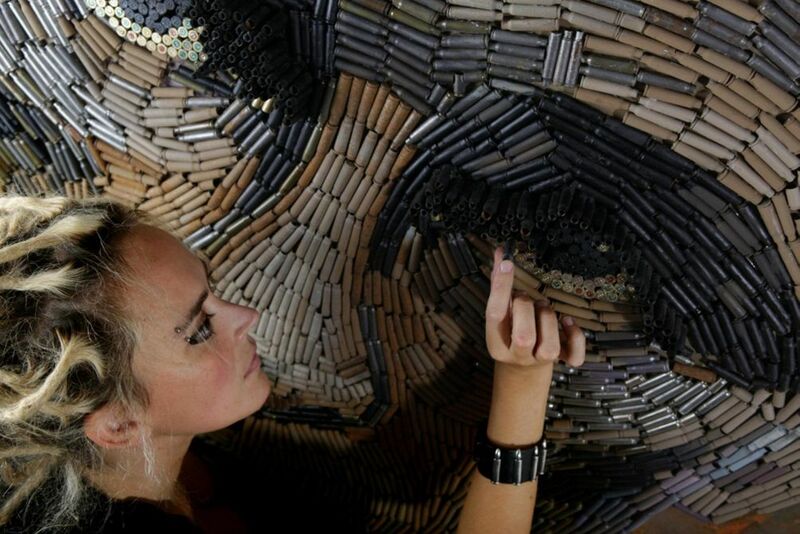 The piece, which stands roughly 8 feet, 5 inches tall, is one of five pieces in an art installation by Ukrainian activists Daria Marchenko and Daniel Green, called “Five Elements of War.” Putin’s face is made out of bullet cartridges gathered during Russia’s military conflict with Ukraine in Donbas. Other artworks to keep an eye out for are less political in nature, including 3-D paper sculptures by Bodys Isek Kingelez at the Museum of Modern Art; Andy Warhol’s “Green Coca-Cola Bottles” at the Whitney Museum of American Art; a personal archive of 400 objects belonging to David Bowie, including his costumes and lyrics sheets, at the Brooklyn Museum; and an exhibit of photography by younger artists at MoMA. Below, you’ll find some of the exciting art exhibits to see in 2018, so you can get a head start in January.